James Harden accepts Kobe Bryant's claim that the Houston Rockets cannot win the title when they rely so heavily on the NBA MVP - but is confident that situation will change when they have a fully-fit roster. 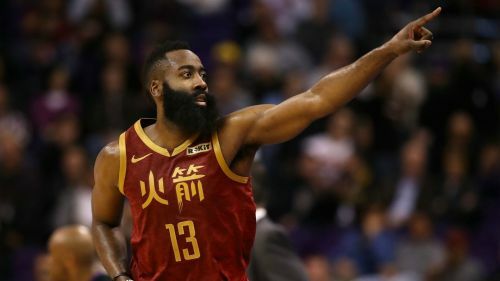 Superstar Harden extended his 30-point streak to 27 games by draining 44 in Monday's 118-110 beating of the Phoenix Suns. It was the 20th time this season that Harden has scored at least 40 points in a match and improved the Rockets' record to 31-22, the fifth best in the Western Conference. "I'm not a fan in terms of winning championships, I don't think that style is ever going to win championships," Bryant said. "[They will not win the title] with this style of play, it won't win with one player dominating the ball." "I mean I have to be ball dominant just because we have injuries," he told reporters. "We had injuries through the course of the year but [when] we get Chris in a rhythm, Eric back, [then we have] multiple guys making plays, multiple guys that can dominate the ball. "Right now he is probably right. This way that we are playing won't happen in the playoffs, won't get us where we want to go, but we haven't had a full roster. Yet I am excited for that to come." "I'm just trying to keep going. Nothing can slow me down," he added. "Nothing can stop me. I'm trying to give that same motivation to my team-mates and it's not about scoring, it's about attacking the game, being aggressive with the game of basketball – defensively, offensively. That's all I can give to them."